This Beko WIC74545F2 is integrated so will fit seamlessly into your kitchen. A decent range of features and high spin speed make this a great family purchase. The Beko WIC74545F2 is a great family buy at an affordable price. The 7kg capacity allows you to wash up to 35 t-shirts in one go! 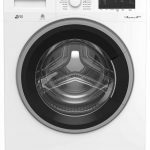 The 1400 spin speed allows for a thorough wash and removes most of the excess water off your clothes. The A+++ energy rating is the highest level available, saving you money compared to less efficient machines. A range of programmes cater for a number of materials: from cottons to down wear, synthetics to a hand wash programme. A Fast+ option reduces the cycle time of most programmes, whilst a Daily Quick is perfect when in a rush. A promotional 2 year warranty gives you added peace of mind on this built in appliance.